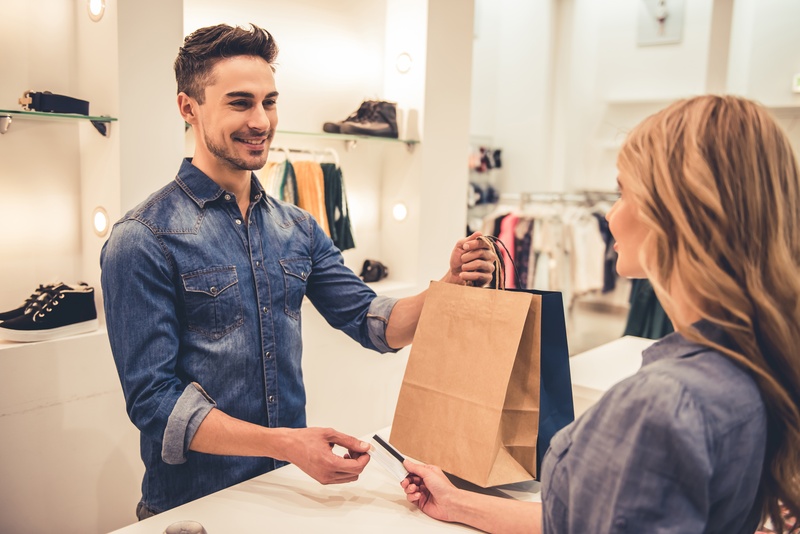 Psychology plays a key role in the success of your retail store — from the display windows that beckon potential customers inside, to the way you display merchandise, to the location you choose for your cash wrap counter. This final step in your shopper’s journey is the last thing they see, so it has to leave them with a positive experience. But your store’s cash wrap is more than a payment center. At least it should be. Properly placed and outfitted, it can be a profit center, too. All it takes is a strategically designed space and some savvy merchandising. Here’s how to create cash wraps that sell. Match design and materials to your other store fixtures, with your logo, or store name on customer-facing sides, to reinforce your branding. Shoppers want speed and efficiency, so cash wraps must be attractive, easy to find, and convenient for both customers and employees to use. Smooth, simple, friendly. It’s like icing on the cake. Who wouldn’t want to return to your store to shop again? The best location for your cash wrap depends on the size and shape of your space, and what kinds of security concerns you may have. However, psychology is critical here, because cash wraps are the final step in your shopper’s journey. Studies show American customers head to the right when entering a store and browse in a generally clockwise pattern. Locating your cash wrap to the left and toward the front enables shoppers to circle through your merchandise displays and arrive at the counter on their way out. But don’t put it so close to the entrance that customers cannot comfortably step inside and get their bearings before they start browsing. Set down their items, even if they have an armload. If there isn’t enough room for all their selections, they may feel as if they’re purchasing too much, whereas larger space may subtly tell them there’s room to buy more. Write a check, sign a credit card slip, or easily reach the card reader. House computers, cash registers, other equipment, tools, and check-out supplies. Efficiently ring up and wrap purchases. A two-part unit — one section parallel to the wall and another free-standing unit placed in front, facing the customer. Three-part design that encloses the two-part unit on one side, creating a horseshoe. Two or three-sided configurations are best if you need more than one payment station, and a U-shape improves security by restricting access behind the counter. By the time they arrive to check out, customers have already made one or more buying decisions, so they’re primed to purchase. With clever merchandising, you can prompt them to pick up just one more thing — or two, or three — by displaying smaller, affordable impulse items where they are easy to see and pick up. Place carefully-selected “deals,” accessories, or samples adjacent to your cash wrap or in a container on the counter if there is room. Choose a combination of must-haves and tempting surprises, preferably items that invite handling. Understanding the psychology of the cash wrap will help you transform it from purely practical to a revenue center. Just think what could happen to your bottom line if every customer spent just $5 more at checkout! Not only that, strategically considered and attractively designed cash wraps will send each customer out the door with a positive experience that puts a smile on their face and inspires them to come back soon.